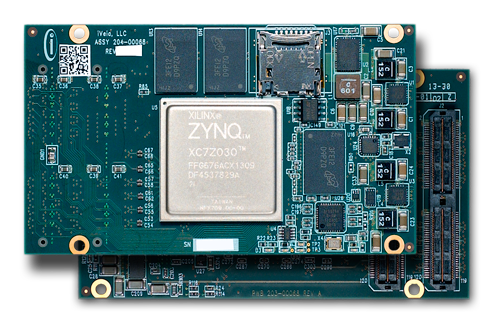 The Atlas-II-Z7x™ is a high-performance small form factor processing module featuring the Zynq™-7000 All-Programmable SoC from Xilinx®. 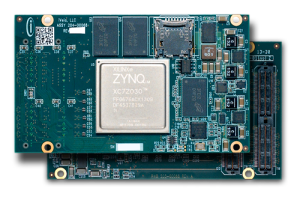 The Zynq devices integrate dual ARM® Cortex™-A9 processors with a 28-nm FPGA into a single device. The ARM cores and logic are connected by a series of high-speed AXI interconnects and cross-point switches creating a highly-integrated device with high-speed transfer capability between the FPGA and the ARM processors. The Atlas-II-Z7x modules are designed to operate reliably in non-ideal conditions and are well-suited to industrial, medical, and military applications.